People, I can’t take a picture of a taco to save my life. I know, I probably should have taken a nice photo of the whole spread – tortillas, chicken, grilled limes, sliced jalapeños, grilled onions and peppers… I didn’t. We had friends over and it just didn’t seem like the right thing to do to make everyone wait to eat. The original photos from Confections of a Foodie Bride are lovely. So there. Take my word for it, these chicken fajitas are good. What’s better than how they tasted is that I didn’t cook them. My husband did all the work. Marinated the chicken all day, prepped and grilled the veggies, even set the table. I can’t in good conscience review something that I didn’t make. But you should. This was tasty chicken. I did, however, lift a finger for something related to Saturday night’s dinner. I made dessert. Not just any dessert. Key lime squares with coconut crust. Hello little bites of heaven! Before we talk about these lovely little morsels, a couple of tips. First, the recipe does in fact make 64 bars. This is because you cut them really, really small so that you can just pop them into your mouth. I thought about making them bigger but I was glad that I didn’t because this size is the perfect bite. Plan to take some over to your neighbor’s house. Or make these for a bake sale. Or make some for your kids to sell at their lemonade stand. Don’t worry, they will go. Fast. Second, Martha says that it will take a half to two-thirds of a pound of key limes to get two-thirds cup juice for the recipe. I missed this little tip when I went to the grocery store. It took me roughly 16 key limes. Key limes are small, people. Juicing 16 limes took time and the juicer was absolutely pointless. If you have minions who you trust to do this task for you, you should totally take advantage. Or buy the damn juice already in a jar. Just saying. Now, after your minions have juiced your limes, this recipe is a piece of cake. I’ll admit that I thought the white chocolate in the crust thing was a bit weird. I take my chocolate dark, thanks. And even weirder was that after I mixed my crust up in my handy-dandy food processor, it seemed to me that the chunks of white chocolate were still enormous. I went with it. I stuck that crust in the oven huge chunks of non-dark chocolate and all. After 20 minutes, I poured my filling (eggs, sugar, flour, and lime juice) right into the hot pan. My filling was set in 15 minutes as directed. I watched that Belmont Stakes while I let my little pan of goodness cool. Don’t you just want to dive right into that plate? The crust is sweet and the lime curd tart for the perfect balance of flavor. My husband doesn’t like lime or lemon desserts. He says they are too sweet and too tart for his taste. He had to taste one of these just to be sure. And then he may have had a couple more. Oh, yeah. And I also made the pico de gallo. I used three Roma tomatoes instead of two because my jalapeño was huge. This takes no time to make and is totally worth it on the fajitas. 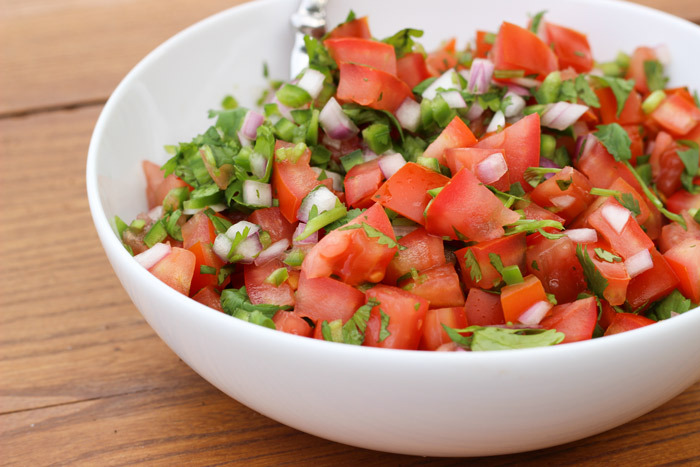 Take the time to make your own pico de gallo here. It is a lovely addition to the meal.